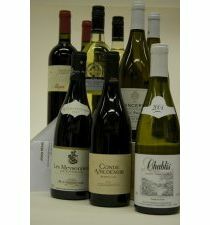 For those that love the classic Old World style, we present a case of beautiful European wines. All of the names should be instantly recognisable and we have chosen producers who make premium examples of these wines. A fantastic case to give or be given. Included are two bottles of each of the following - Pinot Grigio, Macon Charnay, Sancerre, Besaya Rioja Reserva, Valpolicella, and Cotes du Rhone from Southern Rhone.